CLAUDIO, the “Cabo Push Up Guy,” has become one of Cabo San Lucas Icons for Locals and Tourist alike and continues inspiring men and women of all ages, world wide. Former Mexican Marine with nearly 30 years of experience in different martial arts & military drills. Today, after an intense and full recovery from a near death experience as a result from a severe motorcycle accident, Claudio is still The undefeated champion at the famous Cabo San Lucas Push-Up contest. 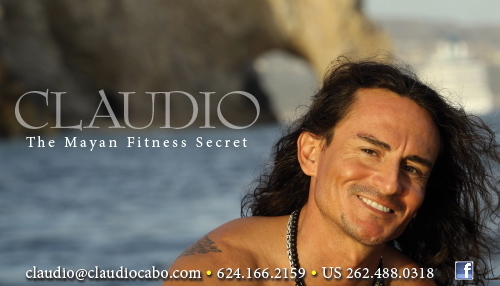 After competing hundreds of times with several pro athletes, USA and Mexico military elite, and fitness enthusiasts from all over the world, Claudio is dedicated full time to share The Mayan Fitness Secret. Training and Inspiring practitioners and followers, one conscious breath at a time.